This unique tour takes you back to the ancient past of Northern New Mexico to visit the cliff dwellings of our "Ancient Ones" and learn the history of the Anasazi and continues to Los Alamos to discover the Bradbury Science Museum which documents the "Manhattan Project" that created the first Atomic Bomb. 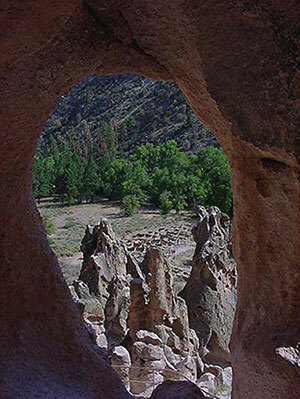 The tour is approximately 4 hours and includes transportation, entrance fee to Bandelier Monument, experienced guide (anthropologist or archaeologist), gourmet box lunches & bottled water. The total cost is $135/person based on a minimum of 10-14 passengers (van capacity). We require advance reservation for transportation & parking space at Bandelier National Monument and 50% deposit for group tours to Bandelier National Monument and gratiuties for guide and bus driver are not included in the tour cost.